There is one post tagged mullaperiyar മുല്ലപ്പെരിയാര്. To be washed away by Mullaperiyar. Yesterday, the Christmas day I had gone out to get few vegetables which we had missed out during the shopping. Everywhere the discussion was about Indian Prime minister meeting with the head of a province / state to discuss about a dam which is supposed to collapse any moment killing millions of people. For the uninitiated: Mullapperiyar is masonry gravity dam which 100+ year old, built during the British rule and it helps millions of people in Tamilnadu to earn their lively hood. The farmers in around 4 – 5 districts depends on this water to grow vegetable which feeds among other people, lots of people in the 100% consumer oriented, white collar job preferring, well informed and literate masses the neighboring state Kerala. The dam under dispute is made of largely mud and is situated in a tectonically sensitive region prone to tremors. The dam may collapse in 10 – 15 years if there are no natural calamities and there is a probability of causing the biggest tragedy known to humans. In the long term it will make another set of people who is using the same water to grow agriculture products will be perished. This makes the scenario a tough one to solve. The information overload created by social media, the trend following masses of Kerala is under a mass hysteria. The main stream media shows only what people needs and no-expert opinion or condition of other dam etc are not considered and from young to old, everyone in Kerala believes the dam will break any moment and the neighboring state and some of the forces is using the occasion to gather some attention. Its interesting to note that the Kerala side is ready to build a new dam, somehow they believe that earth quakes will not happen during the period and are open to share water with neighboring state. The other side claims that the dam made of mud will withstand more water and claims that there will not be earthquakes. Now from a logical point of view, I have no opinions or I am not biased. As far as I am considered, all the dams should be destroyed, all the nuclear plants must be destroyed and no plastics should be used etc etc. A long term solution without impacting both the sides seems to be a solution – which is not about building a new dam or decommissioning the existing one but reducing the water level and then both the sides sitting together around a table and discussing the matters the natural way. Yes, what is happening now is manglish speaking, sorry manglish spitting VJs and radio jockies are celebrating this as a Facebook revolution and this very post has a heading to attract some organic keyword based search from search engines. Now, back to the photo and Christmas New year celebrations. People tend to believe its their last time to celebrate and not leaving any opportunity to celebrate. Years back I remember it was lot more difficult to educate and bring people together to fight against causes. Now its lot more easier. The only trouble is no-one seems to be bothered about real causes. Say Aadhaar aka UID project of India which is about slaving people for their entire life time and probably even after death if their bodies are not burned. In a land of poets and generations of people who never bothered about death or pain but only about freedom and fought for it this is indeed a strange phenomenon. We had poets who wrote, slavery is unacceptable but death is. Have we forgotten ? The irony is complete when another set of people are promoting anarchy in the name of freedom and even using the father or nation for media campaigns. Right now media teams will be getting ready for the 4th season of Lokpal and finding stories supporting and against Anna Hazzare. There are nuclear reactors being built in the neighboring regions which will again make all of us live a dangerous life, probably eating mutated fish, with bulged bellies or long ears and we may not die. We will not die in a immediate flood but suffer, we will have mutated children looking like aliens in hollywood movies. Yet we prefer to live like zombies ? Or are we just zombies who lost the ability to use common sense and educational background to choose between right and wrong ? Anyways, I have my post with enough keywords, I will get lot of clicks just like some main stream news papers who has landing pages filled with the proper keywords. Give me my hits, help me make money. I wish I had a FM station & a TV station or two also !! 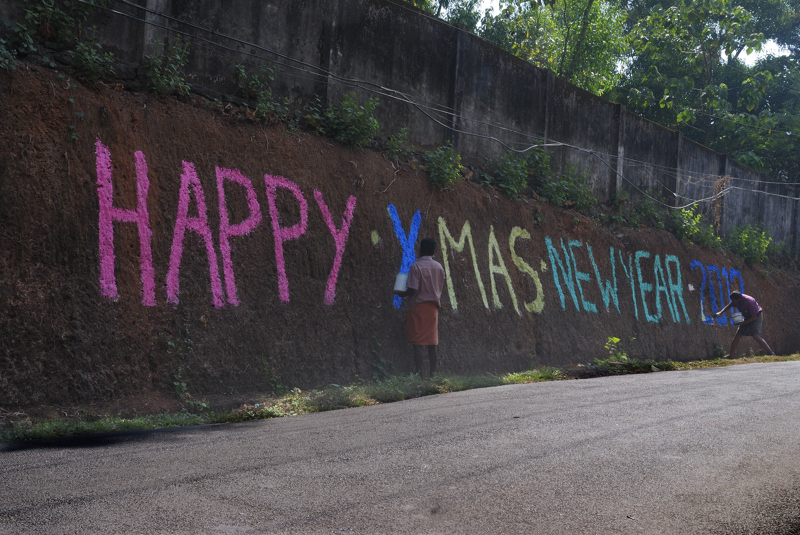 Wishing a Happy New Year and its us who paints our lives happy or miserable and no one can help you do that.